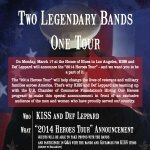 The Def Leppard and KISS tour press conference scheduled for Monday 17th March will be used to announce the 2014 Heroes Tour according to the military1click website. As you may have seen the site has given more details of the event which will take place at the House Of Blues in Los Angeles. The tour will apparently be used to help benefit soldiers and their families - full details and tour dates to be revealed on Monday. The site posted the news in a tweet on 14th March (for anyone who wondered where this actually came from...). The press conference news was first spread online by ABC News Radio. 98.5 WNCX of Cleveland added a time for the event of 2PM ET. Due to US daylight saving time the UK is currently only 4 hours in front of the US East Coast. Watch at Live Nation's website at 6pm (UK) on Monday 17th. "On Monday March 17th at the House of Blues in Los Angeles, KISS and Def Leppard will announce the "2014 Heroes Tour" - and we want you to be a part of it." The "2014 Heroes Tour" will help change the lives of veterans and military families across America. That's why KISS and Def Leppard are teaming up with the U.S. Chamber of Commerce Foundation's Hiring our Heroes program to make this special announcement in front of an exclusive audience of the men and women who have proudly served our country."